Battery electric commercial vehicles are here today and are a growing alternative to traditional diesel, alternative fuel, and hybrid powertrains. Electric trucks are a daily staple of media, conferences, factual research, and hype. Opinions vary considerably about whether this technology is a viable alternative to traditional diesel powertrains. There are some common themes/arguments both for and against electric Class 3 through 8 commercial vehicles. They fall into several broad categories: weight issues, cost issues, and charging/electric grid issues. 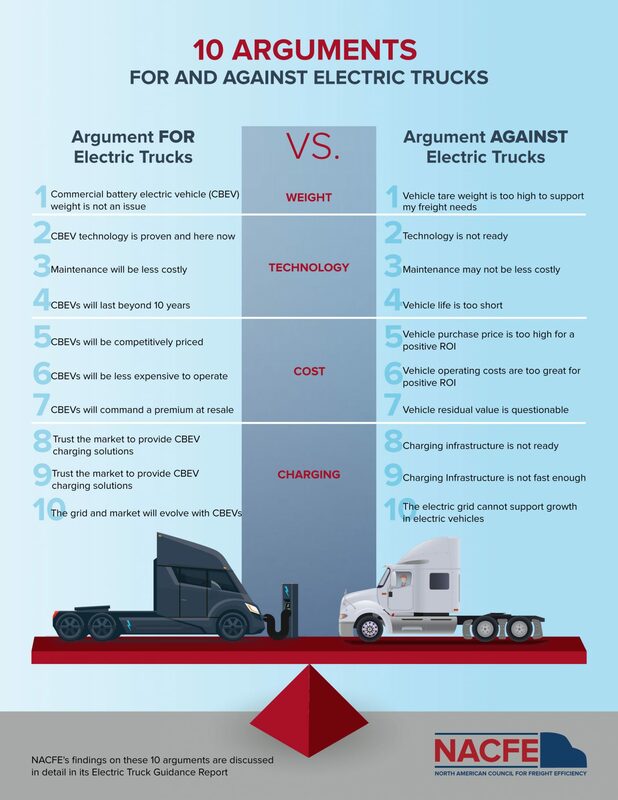 More specifically here are the 10 common themes or arguments both for and against electric trucks. Competitive vehicle tare weights are possible in all classes for many duty cycles. Diesel powertrains also include fluids, emissions systems, exhaust systems, cooling systems, mountings, etc. that in total represent a significant weight reduction when removed. Typical payloads in many applications are well below maximum GVWR. The combination of both of these factors allows for BEV solutions with equivalent freight carrying capacity in many applications, but not all. Off-shift charging of vehicles is possible today with existing systems. The challenge is high speed charging. BEVs needing sub-30 minute charging speeds require high capacity production charging systems that today are only in the conceptual phase. Fleets with well-defined one-driver shift A-B-A, or A-B-C-A type routes, for example, are well positioned for base depot charging. Even fleets with routes between hubs, if range is sufficient, could have charging at both ends of the trip. Fleets with variable routes and no guaranteed return trips will need growth in remote charging capacity before considering replacing diesels with BEVs. The market penetration rate of battery electric commercial vehicles will be on decade’s time scale. The United States has energy production capacity for significant volumes of electric cars and trucks. Adding vehicle charging stations to a warehouse or factory is like adding a new line; a process utilities regularly perform for commercial sites. High-rate charging expected for any sub-30 minute charging of commercial vehicles does create a significant demand on the grid. Alternatives to mitigate this through leveling and storage systems are being considered. Investment in BEVs may require quantifying the true total cost of ownership of both diesels and battery electric vehicles by including so-called intangible “soft costs,” liability costs, indirect costs and opportunity costs buried in overhead or ignored in traditional ROI calculations. Industry pricing of BEVs is still largely ill defined. Pricing experience is largely based on prototype and pre-production experience and estimation. There are many variables including grants, tax breaks and incentives and a largely unknown residual or salvage value. The industry is also developing alternatives to traditional purchasing or leasing. The trend over the last decade is expected to continue with large reductions in cost and significant gains in performance. Diesel performance, in contrast, is unlikely to yield large gains in performance with reduced costs. Introduction of electric vehicles has most of them still within their first owner’s use. The used electric vehicle is in its infancy. Residual value is a question. The value of electric motors and batteries in salvage may prove an advantage as they can be repurposed for non-vehicle uses and may have significant life left. Mechanical systems at the end of vehicle life require reconditioning which can reduce their net value in salvage. Multiple new companies are entering the US market with models ranging from Class 3 to Class 8. Established OEMs have been developing prototypes for field testing in specific markets. Automotive and bus battery electric vehicles have been in production for years and advancing on their learning curves in real world use. Battery capacities are expected to increase and charging time, cost, and weight are expected to decrease. The technology is on the steep part of the development S-curve, where big improvements are regularly expected. The speed needed for charging depends on each fleet’s duty cycles and daily and weekly route scheduling. Fleets that require sub-30 minute charging will need practical commercial vehicle capable charging technology to catch up to their needs. Automotive experience with BEVs suggests maintenance of production designs should be on par or better than equivalent ICE powertrains. Prototypes and pre-production models generally see high infant failure rates and are managed more intensely, so the experience there is not representative of production units in normal field use. 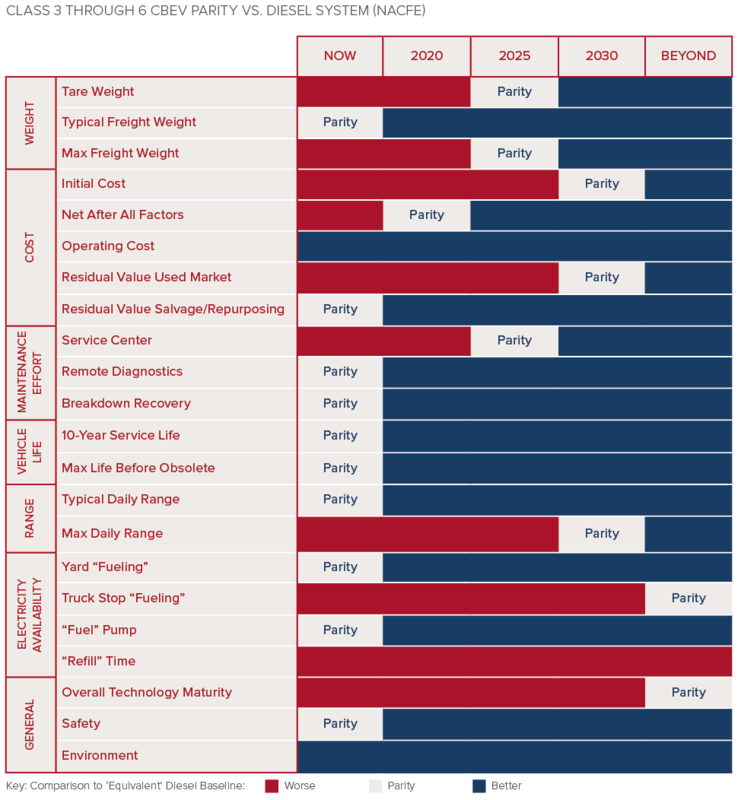 Long warranty periods promised by BEV manufacturers may reduce fleet financial risks on maintenance projections for commercial BEVs, but warranties do not alter truck potential downtime impacts. Operating costs can be less for BEVs. The electric drives are more energy efficient than diesels. The reduction in diesel-based friction-sensitive mechanical systems such as pumps, valves, transmissions, and belts should reduce maintenance and servicing. The track record to date is mixed because much of the truck experience has been through first generation products in small numbers and in prototypes. These early vehicles were expected to have higher failure rates. NACFE’s discussions with fleets, OEMs, and suppliers is that they expect a Class 3 through 8 vehicle life of seven to 10 years before major refurbishing or salvage. With BEVs the battery packs are the most common concern expressed. The manufacturers expect the battery packs to be replaced when they reach 80 percent of their initial capacity. NACFE projected the frequency of recharging events based on automotive experience and determined that batteries will likely exceed the seven to 10 year vehicle life. The fleet’s specific duty cycles and environments need to be evaluated when researching BEV choices. — Dennis Heathfield, NA On-Highway Field Sales, Cummins, Inc.
— Julie Furber, Executive Director – Electrified Power, Cummins Inc.
— Mel Kirk, Chief Technology Officer, Ryder System, Inc.
A focus on efficiency has led several companies to optimize vehicle selection based on each specific duty cycle used in the company. This has led some companies to endorse having mixed technology fleets rather than a one-size-fits-all approach to vehicles. These decisions are driven by careful evaluation of the total cost of ownership and return on investment. 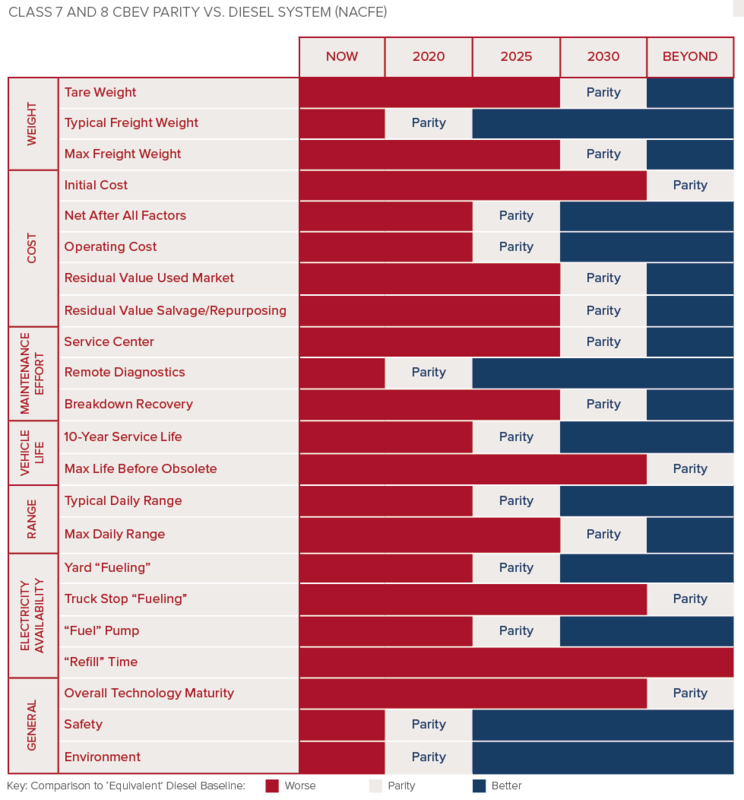 The trend may not be true for all fleets, but it does reflect a modern trend toward specialization for product mixes. BEVs will not be a solution for every application or market, but commercial BEVs will have an increasing role in freight transportation in Classes 3 through 8. The rapid pace of battery energy density improvement will spur increases in BEV efficiency that likely cannot be matched by evolutionary changes to the internal combustion engines. The transition in specific market segments will be drawn out over decades, sharing space with traditional gasoline, diesel, and other alternative-fuel powertrains and also competing with other emerging technologies like fuel cells and hybrids. Mixed fleets (including diesel, natural gas, hybrid, and BEV products) optimized for specific routes and duty cycles will likely be the norm through 2050. Early adopters will be in the urban delivery Class 3 through 6 segments with fairly stable route definitions, loads that tend to cube out, and vehicles that run on shift and return to the same base location. Battery electric commercial vehicles must be reliable to gain market confidence. Maintenance and service cost reduction is an open question at this time. The net costs/benefits of BEVs require more effort than traditionally limited ROI calculations. Multiple factors need to be included, from the straightforward such as grants, incentives and taxes, to hard-to-dollar-quantify items such as emissions credits, brand image, liability costs, disposal costs, indirect costs, driver/technician retention or attraction, potential customers, and other opportunity costs/benefits buried in overhead or ignored in traditional ROI calculations. Longer ranges and heavier weights in Classes 7 and 8 are possible in specific operations, but may not be viable in all roles.